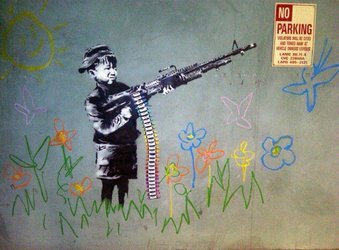 Graffiti artist Banksy is well known to be a political, anti-consumerist provocateur. He’s taken the piss out of everything from Disney to Paris Hilton. However, though he may be nominated for an Oscar for his brilliant Exit through the Gift Shop, it looks like the Oscars are refusing to take part in the fun. The fun but disquieting scenario is that if the film wins and five guys in monkey masks come to the stage all saying, ‘I’m Banksy,’ who the hell do we give it to? Heaven forbid there be any sort of humor in these ceremonies. Personally, I think the Oscars are missing a bet. Let him come to the ceremony in disguise. Let hijinks ensue. Odds are he’s going to probably still do something, be it on the red-carpet or in the ceremony itself. It’d add some levity to a ceremony that has had very little to offer in the way of surprises recently. 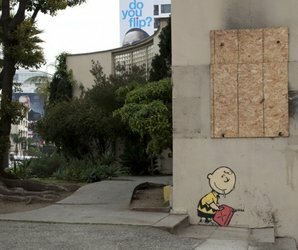 As for what he’s up to now, check out Capturing Banksy. They catalog his work, and he’s already been busy in the LA area. Those pieces he’s done so far are below the fold. This piece has been defaced (if that can be done to illegal graffiti? 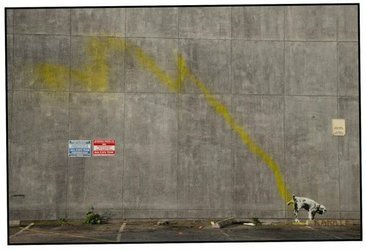 I don’t know) and the vandals humorously tried to pin blame on Mr Brainwash, the subject of Banksy’s documentary. This piece was removed from the wall and reportedly sold for $8,000 on ebay. This was taken down quickly but the company who owns it plans to keep it and hang it in Las Vegas. 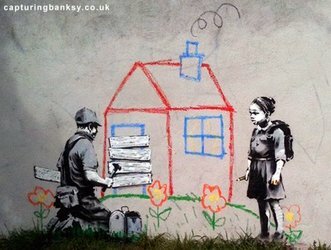 The funny and rather ironic thing about Banksy is how other people make money off of his work. Not even counting those who steal it for t-shirts and such. The billboard sign company is the most ironic to me.